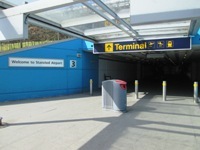 Related link Route to Terminal - Coach Station, Train Station and Short Stay Car Park. Please see the Route to Terminal - Coach Station, Train Station and Short Stay Car Park for further details of how to access the Terminal Building from here. You are on Access to Coach Station. Skip to the next section. 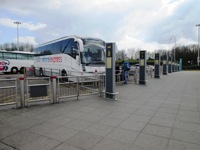 The Coach Station can be accessed via any of the tunnels leading from the Terminal building and short stay car park. Access via the tunnels is via ramp or lift and then easy slopes. Access from the short stay car park is via moderate and easy slopes. 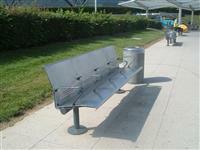 There is seating available along the route from the short stay car park. This seating is fixed with armrests. The seating is 48cm (1ft 7in) high. You are on Ticket Office. Skip to the next section. 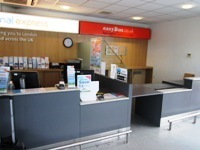 The Ticket Office is located in the main Coach Station building. 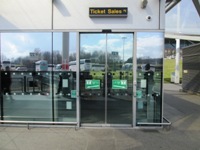 The Ticket Office is accessed via push pad operated automatic doors. The push pad is 100cm (3ft 3in) high. The doors are 124cm (4ft 1in) wide. The ticket is desk is 100cm (3ft 3in) high, but has a lowered section available. To exit the Ticket Office there is another push pad which is 90cm (2ft 11) high. You are on Waiting Room. Skip to the next section. 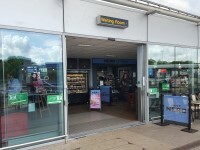 The waiting room is located in the main coach station building. There are 3 entrances to the waiting room. 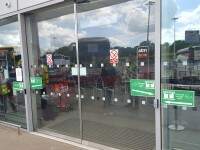 All 3 entrances have push pad operated automatic doors. 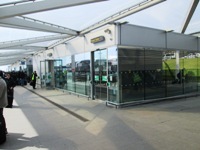 The doors are push pad operated entering the coach station and the doors are sensor operated when exiting the coach station. The push pad is 90cm (2ft 11in) high. All doors open by sliding. As you face the entrances the doors to the left are 275cm (9ft) wide. As you face the entrances the middle set of doors are 265cm (8ft 8in) wide. As you face the entrances the doors to the right are 275cm (9ft) wide. 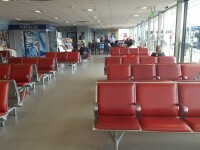 There is fixed seating with armrests available in the waiting room. The seating is 45cm (1ft 5in) high. 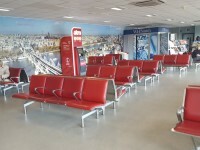 The waiting room contains a WHSmith kiosk, Nero Express, public telephone and vending machines. 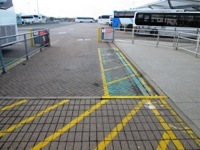 You are on Access to Bays. Skip to the next section. 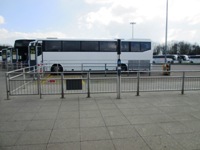 There are 39 bays at the coach station. All bays can be reached by easy slopes. 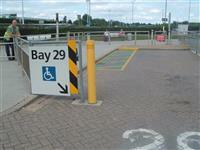 Bay 29 is the accessible bay, with additional space. Coaches serving the station have a ramp to allow level access onto the coaches. There is a help point available at the station, which is fitted with a hearing assistance system. Information is made available on display screens. There are no audible announcements. You are on Access to Toilets. Skip to the next section. 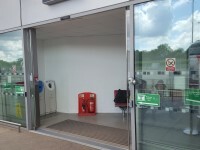 Both the accessible and standard toilets are accessed via a set of automatic doors. The doors are push pad operated and open towards you. The push pad is 96cm (3ft 2in) high. The doors are 155cm (5ft 1in) wide. The accessible toilet is 5m (5yd 1ft) from the toilet block entrance. The accessible toilet is located in the toilet block, next to the waiting room. The dimensions of the accessible toilet are 168cm x 295cm (5ft 6in x 9ft 8in). The lateral transfer space is 220cm (7ft 3in). The towel dispenser is 110cm (3ft 7in) high. 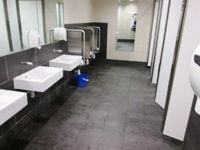 The female and male toilets are located in the toilet block, next to the waiting room. The female and male toilets are 10m (10yd 2ft) from the the toilet block entrance.